This has happened to some of us in the past, whereby we mistakenly tap the wrong key and oops!! our chat is being deleted or lets say you want to find out if your bf/gf have been playing some games behind your back..lol. 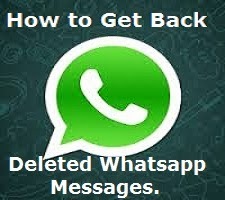 So today am going to show you how to retrieve those deleted whatsapp messages. Step 1) First of all Navigate to the Whatsapp database folder, you will require file explorer for this task. the path is > sdcard/WhatsApp/Databases. Step 2) In the database folder you will see Chat files which are with names similar like msgstore-2014-01-04.1.db.crypt. You may notice the file names have dates as well. but there is a File which is msgstore.db.crypt, we need to rename it. you can add any word before msgstore.db.crypt. Step 3) After renaming that file, From the other Files just select the file which shows appropriate date before you accidentally deleted your whatsapp messages, and then rename that file to msgstore.db.crypt. This Renaming process can also be done on your PC by Connecting your device. Step 4) Now the Final step, Goto Setting>Applications>manage applications>Whatsapp and Click on Clear Data. 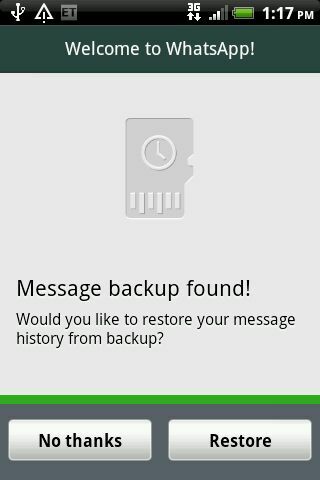 Now open Whatsapp, Choose Restore when it prompts. Thats it, the chat file saved as msgstore.db.crypt will be restored and hence your messages too. Then, you Need to Click on "Restore" instead of "No Thanks". Extra Info: In Case if you have deleted any Image or Audio or Video from your whatsapp chat, then do not worry, its not deleted forever untill you delete it. To view that image or Video all you have to do is with the help of your Preferred file Manager, Navigate to sdcard/WhatsApp/Media Where you will find folders with names Whatsapp Audio, Whatsapp images, Whatsapp video, Open them up to find the file you are looking for. If you enjoyed this Info and wish to be informed whenever a new post is published, then don't forget to Subscribe to our Email Updates!